As announced in the previous post, here we are the story of the projection “Valentina” to re-think chauvinistic buildings and prevent its spread and its dramatic consequences with students of the UPV, in collaboration with the delegations of Students of the UPV and Casa de l’aLUMNE. A very enriching session, thanks for sharing #‎FICAE‬ #‎CasaDelAlumno this vision. An interesting topic to understand the daily situation faced by women in the world, throughout history and today. 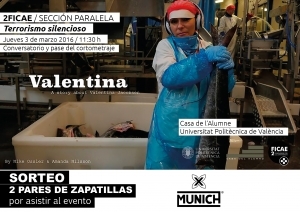 Thanks for students also participate in the discussion after the screening of “Valentina”, addressing issues such as the #‎ViolenciaDeGénero‬, the#‎control‬ #‎RedesSociales‬ or assistance with students, PAS / PDI, and workers in general to have a response to a situation of violence in the #‎UPV‬.